Fairy tales and video slots go hand in hand for some reason or another. So, I did not expect anything else from the Book of Fortune. Front and centre in this game is a magic book, the contents of which can guide you to a considerable fortune. That must sound like music to the ears of every slots player. The game does feel like a fairy tale, and that is in part because of the symbols used. You will encounter the wizard, the princess, the owl and the castle. And you will be hoping for a fairy tale ending, no doubt. But before we get to that, we have to start the game and experience all that it has to offer. 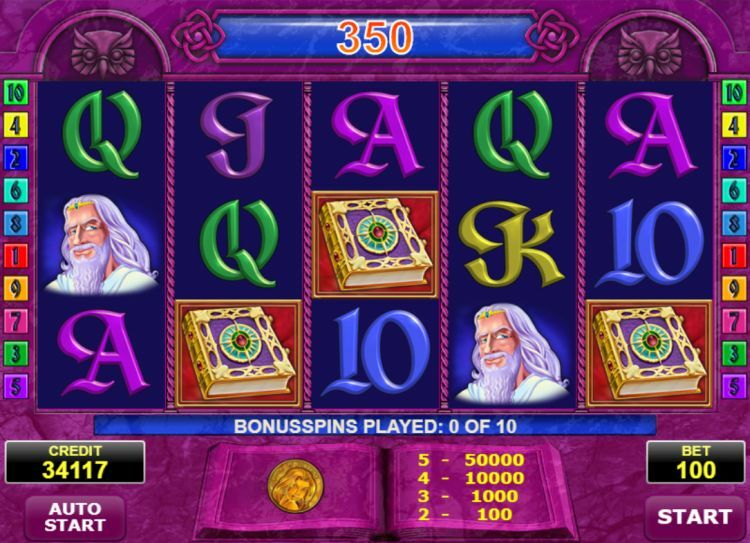 How does the Book of Fortune slot work? Book of Fortune is played on five reels and three rows. You can choose the number of paylines ranging from 1 to 10. Based on a game with 10 active paylines, the minimum bet is $€ 0.10, and the maximum is capped at $€ 10, per active line and per spin. The theoretical payout percentage of Amatic slots is always at least 96%. This game has a high variance. Winning combinations are only made left to right on the screen. Let us delve a little deeper into the symbols of this fairy tale and the prizes that go along with them. 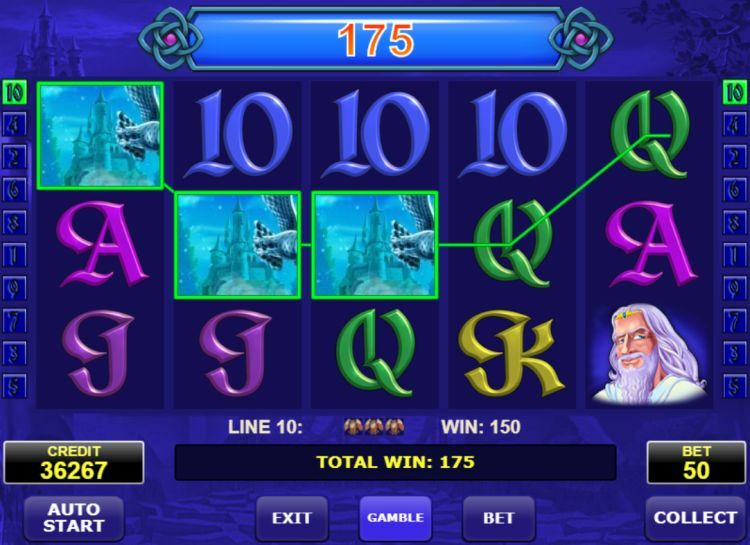 The low-value symbols in the Book of Fortune slot consist of the colourful 10 – A card symbols, which we all know. With a winning combination, these will earn you up to 150 coins. The medium value prizes can be yours with the aid of 2 figures from the fairy tale: the white-bearded wizard and the owl. If you spin a winning combination with these medium value symbols, you will get up to 750 coins. You will need 5-of-a-kind on an active payline. Of course, what you want to see on the reels are the high-value symbols. If you spin the symbol of the princess or the castle in a winning combination of 5 identical ones, you will be rewarded handsomely with prizes ranging in value between 2,000 up to an astounding 5,000 coins. The Wild symbol in the primary game is the Book of Fortune symbol. Spun in a winning combination this symbol will replace all others. When you spin 3, 4, or 5 Wild symbols on the reels your reward will range between 29 and 2,000 coins. 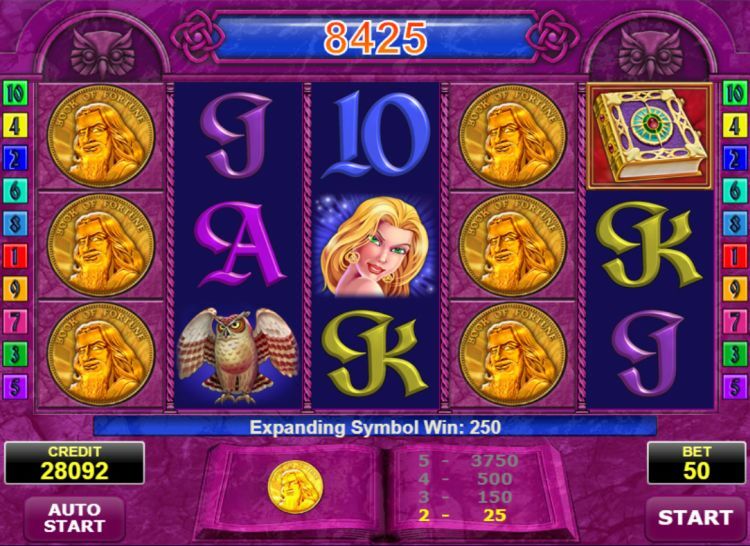 In the Book of Fortune slot, you can also find the Gamble Feature. By guessing the right colour of the card, you double your win, or you multiply it by 4. This is the moment that the magic book or Book of Fortune, which is key in this fairy tale, has to prove that it indeed can lead to a vast fortune. The Book of Fortune symbol serves not only as Wild, but also as scatter in the game. Spin a minimum of 3 Book of Fortune symbols, and you activate the Bonus Feature and win 10 free bonus spins. Now you have to try and create magic with those 10 free bonus spins and in this Book of Fortune Feature that is entirely possible. Before you start to play; however, a special symbol is selected at random. It can be any symbol from the primary game except the Book of Fortune symbol. During the bonus game this symbol functions as an Expanded bonus symbol. One reel is filled with this randomly chosen Expanded bonus symbol. So, it is possible to get a full screen of the same symbol. This is when the “Fortune” part of the title lives up to its name, and in the best case scenario, you can reap a big jackpot of $€ 50,000. 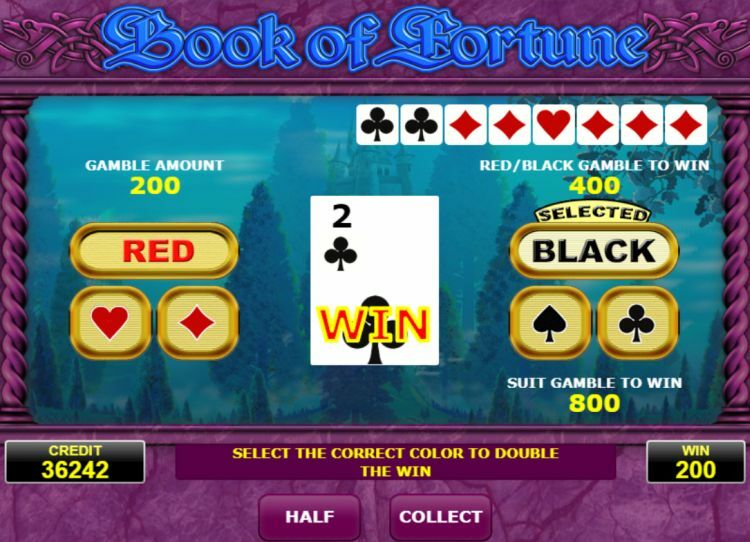 The Book of Fortune slot is a typical Amatic game. That means nothing unique and with decent graphics, but also with excitement in the bonus round. And that bonus round is something to look forward to: this is where you can gather a small fortune and make your getaway. This is mainly because of the Expanded bonus symbol that is randomly selected. I am not quite sure if without this Book of Fortune Bonus Feature, I would be willing to recommend you play this game by Amatic, but I do feel it makes it all worthwhile. Where can you find the Book of Fortune slot? The Book of Fortune slot is found at all reliable Amatic casinos. One of these Amatic casinos is Slots Million, which is one of our favourite online casinos.